an irregularly shaped bone lying between the orbital plates of the frontal bone and anterior to the sphenoid bone of the cranium; it consists of two lateral ethmoidal labyrinths of thin plates enclosing air cells, attached above to a perforated horizontal lamina, the cribriform plate, from which descends a median, vertical, perpendicular plate in the interval between the two labyrinths; the bone articulates with the sphenoid, frontal, maxillary, lacrimal, and palatine bones, the inferior nasal concha, and the vomer; it enters into the formation of the anterior cranial fossa, the orbits, and the nasal cavity, forming the supreme, superior, and middle conchae of the latter. A light spongy bone located between the eye sockets, forming part of the walls and septum of the superior nasal cavity, and containing numerous perforations for the passage of the fibers of the olfactory nerves. the very light, sievelike, and spongy bone at the base of the cranium, also forming the roof and most of the walls of the superior part of the nasal cavity. It consists of four parts: a horizontal plate, a perpendicular plate, and two lateral labyrinths. An irregularly shaped bone lying between the orbital plates of the frontal bone and anterior to the sphenoid bone; it consists of two lateral masses of thin plates enclosing air cells, attached above to a perforated horizontal lamina, the cribriform plate, from which descends a median vertical or perpendicular plate in the interval between the two lateral masses; the bone articulates with the sphenoid, frontal, maxillary, lacrimal, and palatine bones, the inferior nasal concha, and the vomer; it enters into the formation of the anterior cranial fossa, the orbits, and the nasal cavity. The delicate, T-shaped, spongy bone forming the roof and upper sides of the nose and the inner walls of the eye sockets (orbits). The upper part of the ethmoid is perforated (cribriform plate) to allow passage of the fibres of the olfactory nerve, and has a central downward extension forming the upper part of the partition (septum) of the nose. The bone contains numerous air cells (ethmoidal sinuses). A rigid bony cavity in the skull which contains an eyeball, orbital fat, the extraocular muscles, the optic nerve, nerves and blood vessels, lacrimal system and fibrous tissue of various kinds. This packing serves to keep the eyeball reasonably well fixed in place as it rotates. The orbital cavity has the approximate form of a pyramid. The walls of the orbital cavity are formed by seven bones. The medial wall of the orbit consists of: (1) the frontal process of the maxilla (maxillary); (2) the lacrimal bone; (3) the lamina papyracea of the ethmoid; and (4) a small part of the body of the sphenoid. The floor of the orbit consists of: (1) the orbital plate of the maxilla; (2) the orbital surface of the zygomatic (malar) bone and (3) the orbital process of the palatine bone. The lateral wall of the orbit consists of (1) the orbital surface of the greater wing of the sphenoid, and (2) the orbital surface of the zygomatic. The roof of the orbit is made up mainly by the frontal bone and behind this by the lesser wing of the sphenoid. The orbit is lined with a membrane of tissue called the periorbita (or orbital periosteum) which extends to the orbital margin (anterior rim of the orbit) where it becomes continuous with the periosteum covering the facial bones. The periorbita is loosely attached to the bones except at sutures, foramina and the orbital margin where it is firmly attached. The bones are much thicker at the margin (rim) than they are along the walls of the orbital cavity. There are many apertures and gaps in the orbit through which blood vessels and nerves pass (see Table O4). See orbital axis; optic canal; inferior orbital fissure; superior orbital fissure; orbital fracture; cavernous haemangioma; lamina papyracea. Irregularly shaped bone lying between orbital plates of frontal bone and anterior to the sphenoid bone of the cranium. the sievelike bone that forms a roof for the nasal fossae and part of the floor of the rostral cranial fossa. See also Table 10. It extended caudally from level of cribriform plate of ethmoid bone and rostrally merged with middle nasal meatus to open externally. 1,6,10] While the sphenoid, frontal and ethmoid bones are not typically considered facial bones, they are often injured in midfacial fractures and can be considered part of the midface as well. 8) Nasal obstruction frequently involves the perpendicular plate of the ethmoid bone and the vomer, and it is traditionally treated with an open surgical procedure in which the mucoperiosteum is elevated and the offending bone is fractured and/or removed. 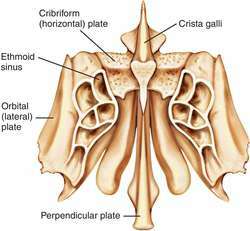 The middle turbinate, part of the ethmoid bone, overhangs the important and complicated area of the middle meatus. According to the embryologic theory, osteomas that arise at the junction of the developing membranous frontal bone and the cartilaginous ethmoid bone predispose to the development of cell rests and later tumor formation. Bone scan revealed focal abnormalities in the upper thoracic spine, ethmoid bones and base of the skull. Among his injuries were major and multiple fractures of the cranium, frontal bone, nose, orbits, ethmoid bones, mid-face and anterior skull base, together with damage to his brain and leg.